“If you don’t do anything, nothing will happen.” Nancy De Los Santos Reza learned this important lesson early in life. College wasn’t an option, so she got a job as a secretary. A colleague, an older woman who had taken a liking to her, encouraged Nancy to ask her supervisor about attending a professional conference in California. “What’s the worst that could happen?” the woman asked. “They say ‘no’ and you don’t go? You’re already not going.” As a result, Nancy found herself in San Francisco on a life-changing trip. She would go on to earn two college degrees and become the producer of Roger Ebert and Gene Siskel’s movie review program, At the Movies. De Los Santos Reza’s is one of eight inspiring personal essays by Latinas included in this collection. Each contributor overcame obstacles to happiness and success, and here they share their life lessons in the hopes of motivating others. Whether overcoming fear, guilt or low self-esteem, these women seek to encourage others to discover their personal power. With a foreword by acclaimed musician Vikki Carr, 8 Ways to Say “I Love My Life!” contains chapters by women from a variety of professional backgrounds. Contributors include Latin Heat president Bel Hernandez Castillo and playwright and author of Real Women Have Curves, Josefina Lopez. 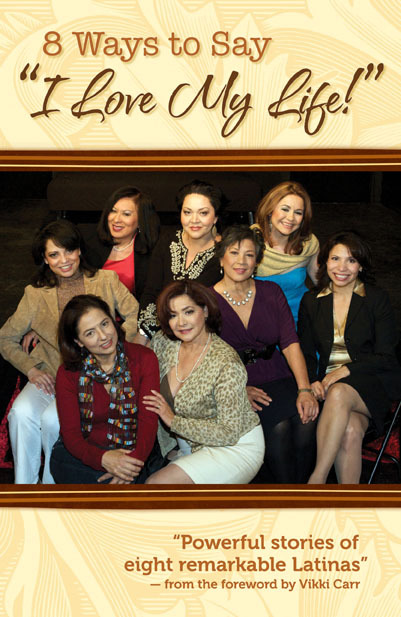 Performed as monologues in 2009 in Los Angeles, the sold-out, ten-run show received a rave review in the Los Angeles Times and an Imagen Award, which recognizes positive portrayals of Latinos in the media. Designed to help women believe in the power of self-love and inner strength, this book will appeal to all women who seek a path to fulfillment. Click here to listen to an interview with one of the book’s contributors, Josefina López. SYLVIA MENDOZA is an award-winning journalist and author of The Book of Latina Women: 150 Vidas of Passion, Strength and Success (Adams Media Corporation, 2004). She lives and works in Encinitas, California.